Guest post by Ian Clarke about their journey to solar in New Jersey, part of the Solar Should be Simple series written for Green Lifestyle Consulting. First, we needed to select a contractor. I had begun building a rapport with the consultant I met at the conference, and he had a solid relationship with a contractor, who while based in New York State, had done several installations in New Jersey. That should have been a warning to us. It transpired that those installations were commercial/industrial, not residential. The rules for residential solar installations in New Jersey are somewhat different from those for commercial/industrial facilities. I’ll have more on that later. As far as the size of the installation, we wanted something that would cover 100% of our consumption needs. The question was very much what were our needs? Over the years, we’ve become more judicious in our use of energy, including installing compact fluorescent light bulbs and keeping thermostat levels reasonable, plus we double insulated our attic. That alone reduced our overall heating and cooling bills by about 25%. Jamie drove a Mazda CX-9 for her trips to the school, library, and sports fields, etc., most of which are within 10 miles of the house. That got us thinking, what about an electric car? Soon we’d be generating our own emission-free electricity, and I was pretty sure that gasoline prices weren’t going to be coming down any time soon. Again, the economics made a lot of sense and only bolstered the case for solar generation. We put down a $99 refundable deposit on a Nissan Leaf, which is 100% electric. We did some investigation into the likely power consumption from the car based on the estimated mileage we’d be driving and added that to our household consumption figure to get a total size for the solar system of about 12,000 kW DC, including some room to expand our electricity use, ideally at the expense of natural gas. That would get us about 14,000 kW AC, based on the various factors we plugged into the on-line PV Watts system, which is the standard model used across the country for estimating likely solar generation output, based on geographic location and proposed system characteristics. Given that estimated system size, it quickly became apparent that a roof-mounted array was out of the question, even though it faces almost south. There wasn’t enough real estate, the roofline precluded uniform, full sun, and the roof was already 10 years old. Ideally, it needed to be re-roofed to handle a solar system that has an expected lifespan of 25-30 years. 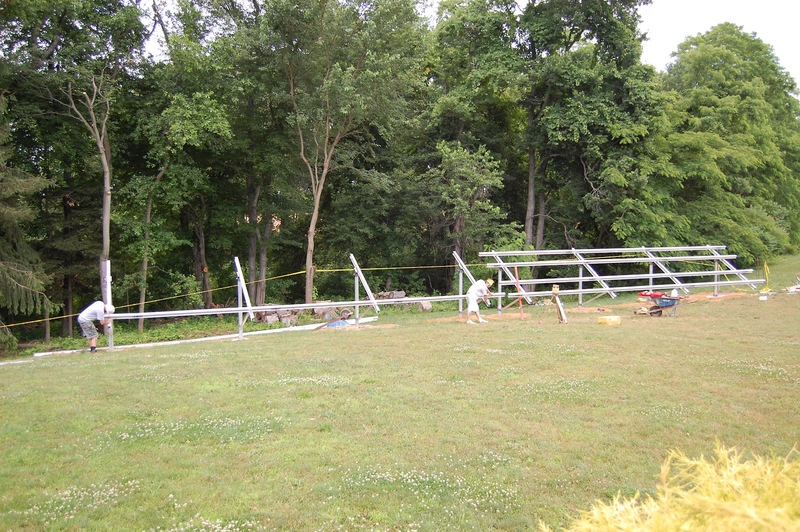 Fortunately, we have more than enough backyard to accommodate a ground-mounted array, and we welcomed the opportunity to reduce the amount of lawn that needed to be tended. The price quotation we got from that New York-based contractor seemed rather high, so we embarked on a quest for competing quotes. The high price of N.J. SRECs had engendered a gold rush of contractors seeking solar installation business, so it should have been relatively easy to get those additional quotes. We quickly encountered rampant charlatanism, outright sexism and, in some cases, an arrogance bordering on rudeness that would be grounds for dismissal at any company I’ve worked for. Many of them questioned the system size, saying that the state would only allow us to install a system that reflected our most recent 12 months of consumption. Ultimately, we discovered that we could apply for a larger system, and that we’d need to submit a load forecast based on additional consumption from the car and also the electric clothes dryer that we planned to purchase as a replacement for our ailing natural gas appliance. The main lesson learned from this, and one that has been reinforced throughout this saga, is that we needed to do the fact finding and chasing ourselves. Many contractors seem to have an impartial view of the solar world at best and an erroneous one at worst. Nevertheless, we did get competing quotes, which prompted our contractor to reduce the cost estimate quite considerably. That should have been an orange flag that these guys didn’t exactly have their finger on the pulse of the situation. In 2010, New Jersey was still offering rebates on solar installations, depending on the rated output of solar power. Unfortunately, our N.Y. contractor filed the wrong paperwork and filed it late, so the application was rejected by the state, a mere two months or so after it was filed. The contractor didn’t have much of a response to that beyond “sorry”, so we parted ways with him. The lost rebate amounted to about $8,000. This chapter is a part of the Solar Should Be Simple Series written by Ian Clarke about his family’s journey to install a residential solar array at their home in New Jersey. You can read more about their journey to solar or check out our own journey to solar in Massachusetts in our Going for Solar Series. Happy Greening!